Christie’s will be hosting its upcoming New York Magnificent Jewels auction on April 16, 2019. It is quite disappointing to see that they are not able to offer many unique Fancy Color Diamonds. In their defence, and as we have previously stated, it is becoming more of a challenge to find those unique investment opportunities. I have chosen just a handful of items that I think would be of interest to some buyers. Some of the items would be nice as jewellery pieces, but less than a handful would be considered an investment opportunity. A rare pair of Yellow diamonds are presented as earrings. 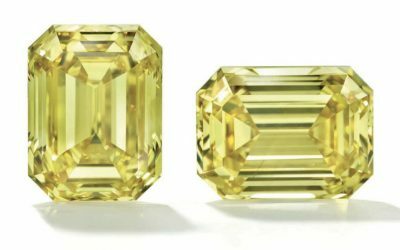 The 7.55 carat and 7.51 carat, both with VS1 clarity and are a Fancy Deep Yellow in a beautiful cut corner shape are valued at between $700k to $1 million in total or $46.5k to $66.4k per carat. Let’s see what they go for. Remember that Fancy Vivid is preferred to Fancy Deep for investment purposes. A 37.65 carat, Fancy Intense Yellow diamond with a VS1 clarity is being offered and is valued at between $600k to $800k in total or $16k to $21k per carat. For such a size diamond, the price is conservative or the color may be weak. The results will speak for themselves. 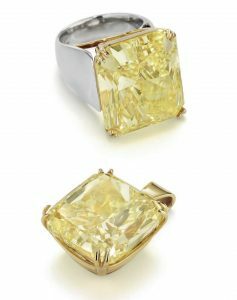 Another 35.06 carat, Fancy Intense Yellow with a VS1 clarity is also being offered between $500k to $700k in total or $14k to $20k per carat. Similar to the above mentioned diamond, either the color is weak, closer to a Fancy Yellow, or we will see the price go closer to $30k per carat or higher (same for above). Please note that auction houses prefer putting a lower valuation spread in order to attract more bidders, but eventually as we get close to the true value, less people will bid on the items. A 6.11 carat, Fancy Pink diamond is being offered. It has a VVS1 clarity and is also a Type IIa. Christie’s has valued this diamond at between $1.2 million to $1.5 million or $196k to $245k per carat. 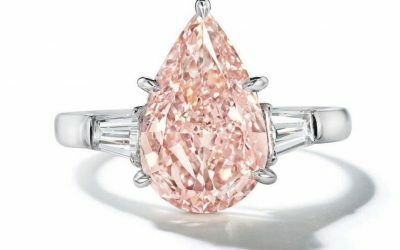 Based on this value, there are again 2 options; Either the color is weak, which means it is closer to a strong Fancy Light Pink, or in the case where the color is stronger, we will see that the value for this diamond sells above $350k to $375k per carat. The most valuable Fancy Color Diamond at this auction is a ring with two Fancy Vivid Blue diamonds. 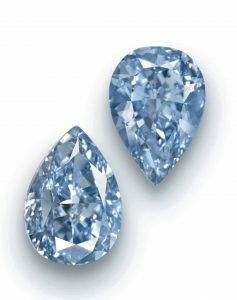 The 3.06 carat, and the 2.61 carat, Fancy Vivid Blue diamonds are pear shape as well as VS2 clarity for both. 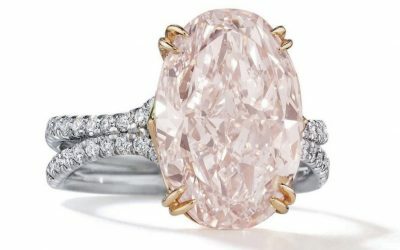 The value given here is between $6 million to $8 million total or $1.06 million to $1.41 million per carat, on average based on a total of 5.67 carats. What do you think will happen to the value of the twin Fancy Vivid Blue Diamonds? will they sell? will they achieve the valuation given by Christie’s, or will they surpass the value? I guess it all depends…let’s see what happens.